In today's gospel reading (Luke 1:39-45) we are reminded that Mary's body became the temple of the living God. It is this very concept that caused me to begin my search for the "true church." This was a concept I could relate to - the idea of God within, but I wasn't quite getting hold of it in the way I wanted to. I am going to tell the story of my conversion to Catholicism in several posts. I'm doing this for my children so that some day when they are interested, they can have the facts for themselves. I was raised as a United Methodist so this was also my church of choice in my college years. I did not attend church every week, but went frequently enough to identify with the denomination. 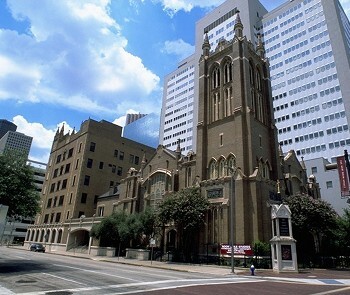 As a young single adult, I stumbled upon a large congregation in downtown Houston and that church was instrumental in forming my religious identity. First United Methodist - also known as "First Church" -- was led at that time by Dr. William Hinson, an inspiring preacher from Georgia. I think I attended the first time close to Christmas. I loved not only Dr. Hinson's preaching, but I loved the "high church" atmosphere - the liturgy, the responsorial psalms, the participate aspect of church. I appreciated the way the scripture upheld the service rather than being brought in as proof for the preaching. I do not remember how it happened, but eventually I began attending an adult Sunday School class, something my parents had set the example for when I was growing up. Through Sunday School, I learned about the single's group. The congregation had a vibrant and growing Single's group. This group became a formative influence on me. I was in the group for many years and through my association with them, became involved in many other areas of ministry, eventually going to work for First Church. In this nourishing environment, I began my search for the true church; I was strongly influenced by a program called "Disciple" which I will talk about later. So back to today. It's the fourth week of advent, only a few days before Christmas. My question for today is now that I'm here, how am I going to honor the presence of the Holy Spirit in me? And how am I going to encourage the same in my children? I'm excited to read your story. As a cradle catholic I don't have an exciting "conversion story" I was born and raised catholic and have always just gone to church and being a goody too shoes "kept going to church" and since I didn't really have a social life was involved in youth group and other ministries "for something to do" but I also believed in everything being taught/was learning. Thanks so much for stopping by. I'm sorry I'm so late responding. I am slowly adding the bits to my story. I will work on part 4 this week. Blessings to you! I have a successful marriage of 21 years and five wonderful children who amaze and challenge me every day. I am a Special Ed Teacher, a professional Life Coach, a Certified Personal Trainer and an advocate for children. I have an amazing, full-on, wonderful,crazy life. What more can I ask?